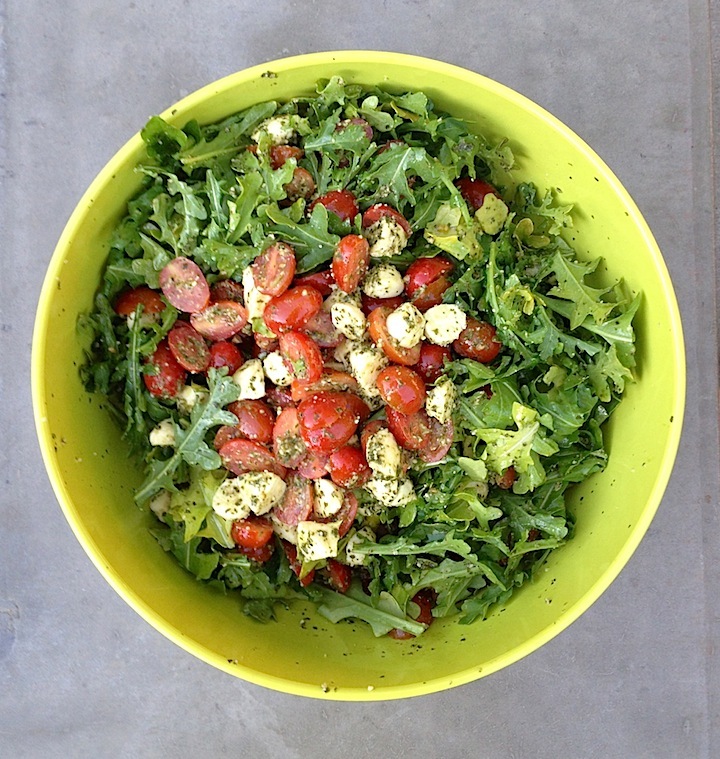 You’ve heard me talk about Sprouted Kitchen before…i’m kinda compulsively following this site. Not only are the pictures gorgeous, but it’s my go-to for healthful food that incorporates seasonal produce. Plus? Every single recipe i’ve tried has been delicious! Case in point: Kale pesto. Kale is definitely a buzz word at the moment. It is, indeed, one of the healthiest things you can put in your body and we could all benefit from eating more of it. i’m just looking for some unique ways to serve it more. Kale pesto: Trim the kale spines and chop the leaves. Add to a large pot of salted water to a boil. 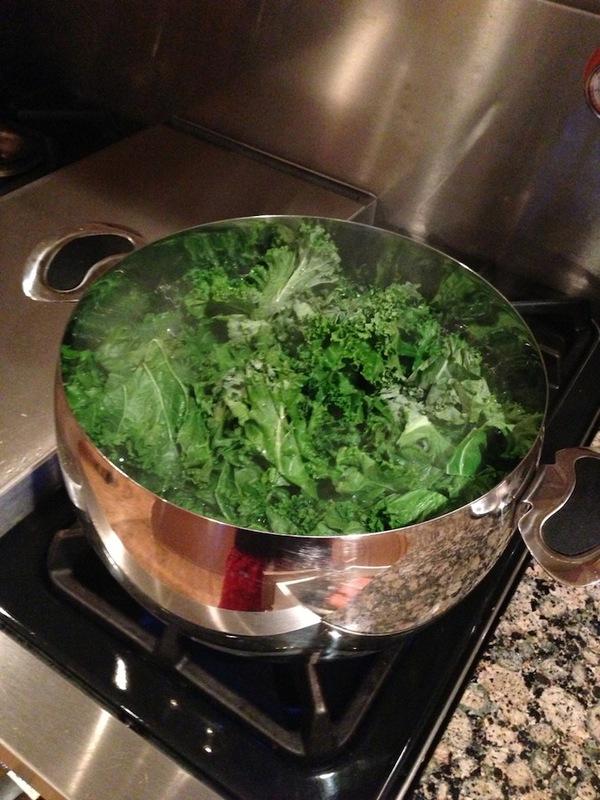 Blanch the kale leaves for about 30 seconds, transfer to a strainer and run cold water over them to stop the cooking process. 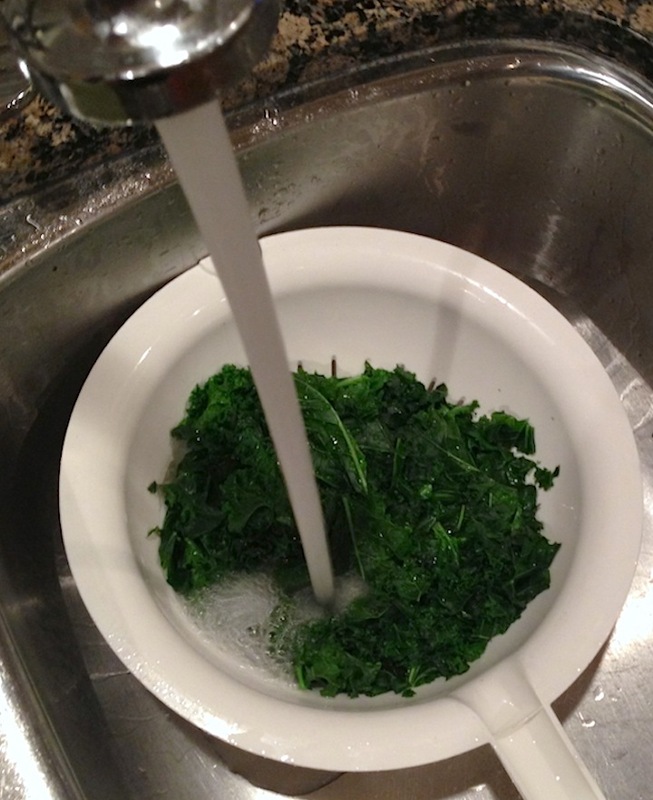 Once the kale is cool, squeeze out the excess moisture. Combine the garlic and walnuts in a food processor and pulse. 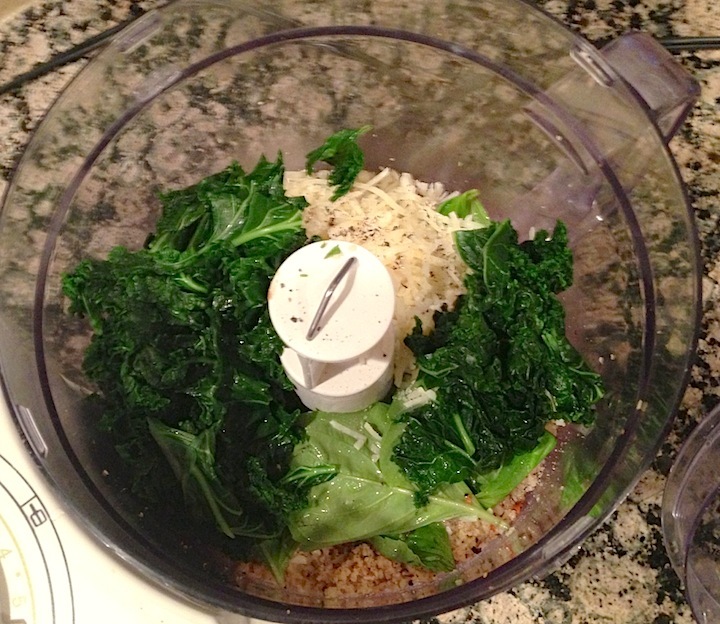 Add the kale, basil, parmesan, red pepper flakes, water, lemon juice, 1/2 tsp. each salt and pepper and pulse to combine. Turn the processor on and drizzle in the olive oil until you get the consistency you like. Thin with a bit more lemon juice and a splash of water for a more dressing-like consistency. 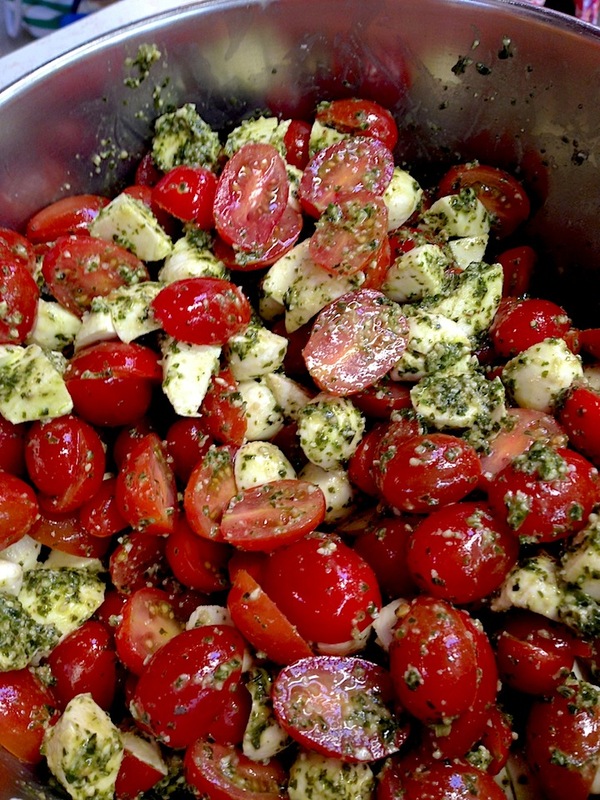 Slice the baby tomatoes and mozzarella balls in half and collect them in a large mixing bowl. Add a few spoonfuls of the kale pesto and toss gently to coat, adding desired amount of dressing. Add the arugula leaves and serve. 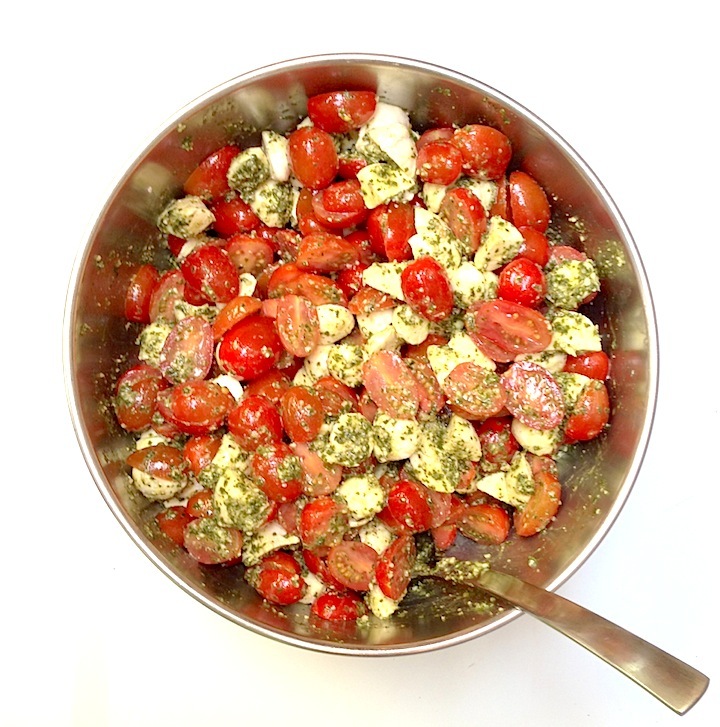 The Sprouted Kitchen recommends that you marinate the bocconcini and tomatoes for a couple of hours in the dressing. I agree that not only does it allow the flavours to meld together beautifully, but it will save you on assembly time when you are ready to serve it. 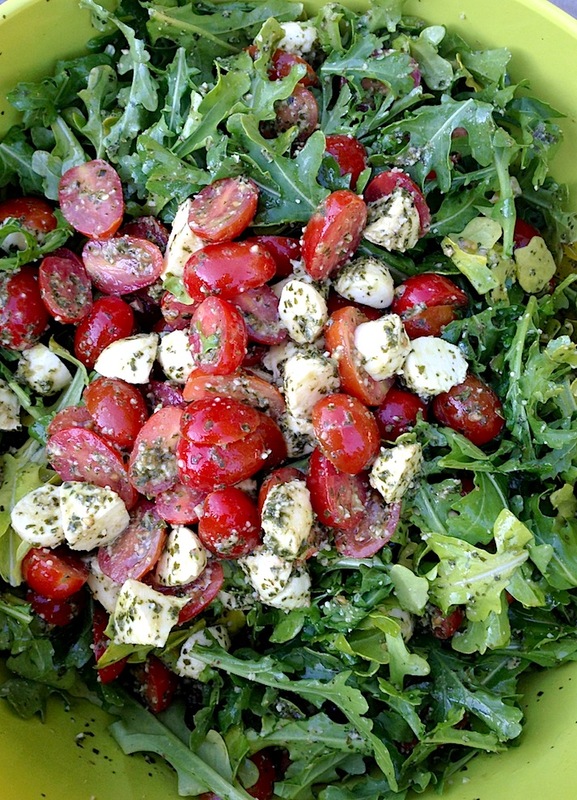 Add the arugula and serve…delish! ***I froze the leftover pesto and used it as a marinade on pork tenderloin…huge flavour!! This will make more kale pesto than you’ll need to dress this salad. It is excellent on eggs, as a sandwich spread, an alternative to pizza sauce, tossed in with some noodles or as a dip. Baby tomatoes are up at the farmers market, I love the sweet 100’s, but any ripe baby tomato is just fine here.